As the “lazy” days of summer gave way to a new fall season, the impending midterm elections, Brett Cavanaugh’s Supreme Court nomination, ACA litigation in Texas, and state Medicaid expansion ballot initiatives—to list just a few hot button issues—promised a season as contentious as any in recent years. Recent revelations of serious lapses in nursing home staff and patient care took center stage in early September at a House subcommittee hearing. Representatives of HHS’ Office of Inspector General and the General Accountability office testified about their published findings, and a number of advocacy groups submitted written testimony. A video of the entire hearing, as well as witness statements are on the subcommittee’s website . 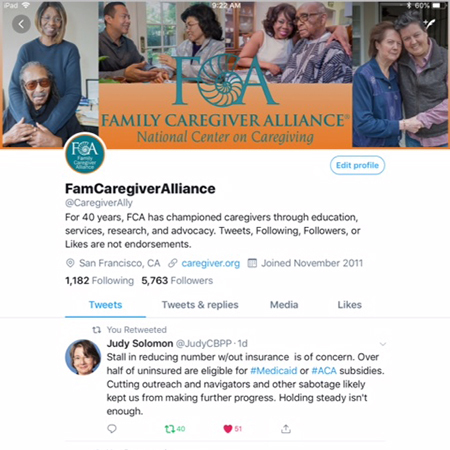 Advocacy groups’ contributions included statements by the National Consumer Voice for Quality Long-Term Care and the Center for Medicare Advocacy. Family caregiver pool: The aging demographic trend will have a profound impact on family caregiving. In 2015 there were seven people ages 45 to 64 for each person age 68 and older. In 2030 it is estimated that the “family caregiver support ratio” will drop to four to one. Projections then show it falling to about three to one in 2050, when all baby boomers will be ages 85 or older. Diversity among LTSS recipients: The older population is becoming more diverse. This growing diversity of the older population will impact how LTSS are provided in terms of meeting diverse personal and family caregiver preferences, arranging for language translation services, providing services with cultural sensitivity, and training healthcare providers in cultural competence. Cost challenges: The cost of LTSS is not within reach of most families across all the states. The annual median cost for nursing facilities ($97,455 for a private room) is more than double the median income of older households. Need for more home and community-based services (HCBS): Generally people prefer to live at home and in the community. Yet the system favors more costly nursing facility care for older adults and people with physical disabilities. Even though Medicaid spending is becoming balanced toward more HCBS, the level of balance varies dramatically among states and populations. While 40 states became more balanced between 2011 in 2016, 11 states became less balanced for older adults and people with physical disabilities. Los Angeles is about to welcome an innovative approach to respite care for family caregivers of Alzheimer’s patients. Care will be offered free by the Youth Movement Against Alzheimer’s YouthCare, utilizing trained undergraduate and master students. The program’s venue will be downtown Los Angeles and it will be offered on Fridays and Sundays from 1 to 4 PM starting September 14 through December 2. Interested family caregivers should visit the YouthCare’s website for more details and sign-up information. ﻿A significant driver of financial anxiety for Americans of various generations comes in the form of surprise medical bills. Such bills, in fact, top the list of healthcare costs Americans are most afraid they will not be able to afford, with four in 10 people saying they had received a surprisingly large invoice within the past year, according to a new Kaiser Family Foundation poll reported by Kaiser Health News’ Jordan Rau. KFF found that 67% of people worry about unexpected medical bills, more than major insurance deductibles, prescription drug costs and the basic staples of life: rent, food and gas. A quarter of people who said they received a surprisingly large bill attributed it to a doctor, hospital or other provider that was not in their insurance network. 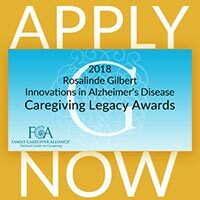 ﻿Family Caregiver Alliance—with The Rosalinde and Arthur Gilbert Foundation—are pleased to announce the Rosalinde Gilbert Innovations in Alzheimer’s Disease ‎Caregiving Legacy Awards for 2018 are now open and we are accepting applications. Visit our information page for directions and link to the online application. Previous applicants are encouraged to apply again. 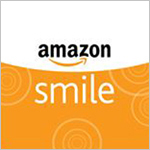 Please share this announcement with any nonprofit or public organizations who are potential candidates for an award. ﻿FCA Board Member Rajiv Mehta has been recognized as a 2018 Influencer in Aging by Next Avenue. 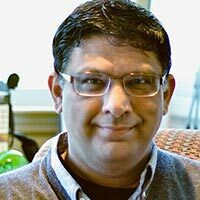 Rajiv is the founder and CEO of Atlas of Caregiving , a nonprofit with the mission and vision to address caregiving challenges through a knowledge of the day-to-day experiences of family caregivers. 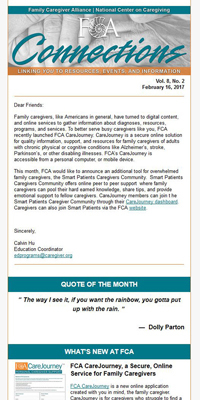 FCA was pleased offer support to the Atlas of Caregiving pilot project in 2015 and continues as a proud partner.